My name is Ken LaVoie, owner of LaVoie's Landscape Mgmt. Inc. and author of this package. This book (and optional support materials) is based on the knowledge and lessons I've accumulated over twenty-six years in the lawn care and landscaping business. I will do my best to teach you how to start a profitable lawn care business or improve your excising one. My goal is to give you what you need to create a great little business and earn a respectable income with benefits. I take pride in this material: I've put my name on it, and I stand by it with a 6-month money-back guarantee. If you don't feel it's delivered enough value to you, I don't want you to pay for it. 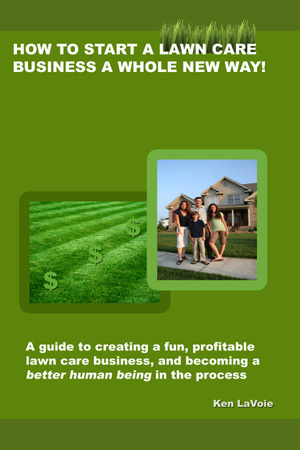 Our eBook / Kindle Book "How to start a lawn care business a whole NEW way" complete with tips on what equipment to buy, how to use it, tips on office setup, finances, marketing, with a "how to" section for each task. Also included is a resources list that can save you alot of trial and error. 12 Letters to send clients for price increase, "welcome back", etc. Disclaimer: ClickBank is the retailer of products on this site. CLICKBANK™ is a registered trademark of Click Sales, Inc., a Delaware corporation located at 1444 S. Entertainment Ave., Suite 410 Boise, ID 83709, USA and used by permission. ClickBank's role as retailer does not constitute an endorsement, approval or review of these products or any claim, statement or opinion used in promotion of these products.